USD/JPY has been crawling upwards amid a better market mood. Reports about progress in US-Chinese trade talks helped. How far can it go? The pair faces tough resistance now. 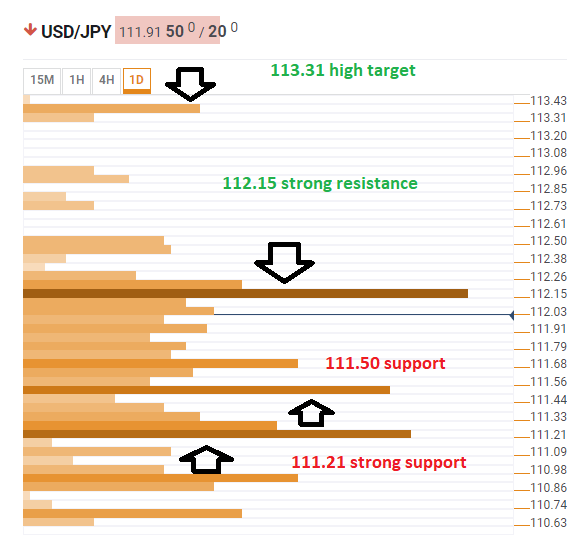 The Technical Confluences Indicator shows that USD/JPY is capped at 112.15 where it faces a dense cluster of lines including the Pivot Point one-month Resistance 1, the previous one-day high, the previous monthly high, the Bollinger Band one-day Upper, the Simple Moving Average 10-1h, the Fibonacci 23.6% one-day, and more. If it manages to break higher, the next cap is 113.31, where the Pivot Point one-month awaits it. Looking down, support awaits at 111.50 which is the convergence of the SMA 5-1d, the SMA 200-1h, the SMA 10-1d, the SMA 50-4h, and the BB 4h-Middle. The most significant support line is at 111.21 which is the confluence of the PP 1d-S3, the PP 1w-S1, the Fibonacci 61.8% one-month, and the SMA 200-4h.